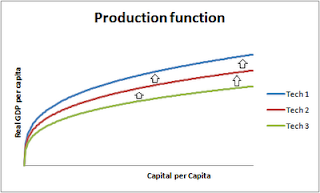 The per capita production function and the determinants of labor productivity - FreeEconHelp.com, Learning Economics... Solved! Better machinery and equipment: such as faster computers, or more efficient energy generators. Better management and organization: the assembly line is famous for a better way to organize production, or shipping methods developed that reduce storage costs. Increases in human capital: Better trained and educated people are able to produce more goods and services because they understand how to use capital more efficiently, and can use their training to work more efficiently. To get the per worker production function, we need to start out with a production function. Here I have assumed a Cobb-Douglas production function (this means that the inputs are multiplicative instead of additive or another form). This is our per capita production function. 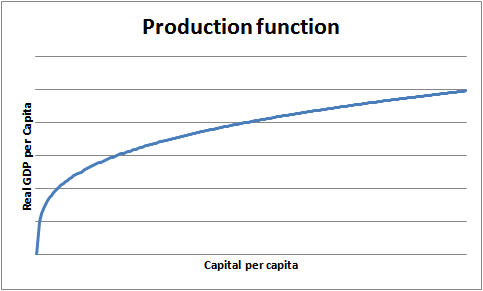 We can use the per capita production function to show the relationship between Real GDP per hour worked and Capital per hour worked. Note that the line increases a lot at first, and then flattens out. This shows how the first few units of capital have a big effect on production, but after the economy invests in more and more capital per worker, the effect diminishes. Imagine someone digging ditches, the first shovel is very helpful, maybe even the second shovel can become helpful if it is different in some way (like pointed, or bigger, made for different types of dirt), but after the third and fourth shovel, the gains from having shovels is diminished. This shows the diminishing returns nature of capital. We can also show how technology will change this production function line, showing how capital and labor become more efficient in producing things. We can use this idea of the production function to discuss the differences in economic growth between the United States, China, and Russia. The U.S. for the latter half of the 20th century has had relatively low economic growth because it has relied solely on technological growth. Real GDP per capita was already very high, and capital per worker was also very high. The economic growth thus came from new discoveries in technology. During this same time in Russia, capital per worker was very low. Russia was able to experience economic growth because they could invest more capital into their economy and thus produce more things. However, we can see that capital experiences diminishing returns so this was not the long term answer and explains why the Russian economy slowed in the later years. Because Russia didn’t have the proper incentives in place, workers stalled at adopting new technology which limited growth. Finally we can look at China. China began with both low technology, and capital levels. By using technology from the rest of the world, and heavily investing in capital, China experienced enormous growth rates. Because their population is so high, large amounts of capital investment would be needed until the full effects of diminishing returns could be experienced. Also, by acquiring technology cheaply from other countries (instead of developing it themselves) they were able to benefit from huge increases in A (technology) which kept shifting their production function up.